Caramel apples have a special place in my heart. You see, when TechyDad and I were long distance dating, we would meet up half way between where we lived. We would spend the day shopping, grabbing lunch, and then we would splurge and have an amazing candy coated caramel apple together before we went our separate ways. Thanks to MomImpact, we found out about Mrs. Prindable’s Gourmet Apples. In April, we were sent their Triple Chocolate creation. This apple tops my list as the best gourmet apple I had ever had. Everyone in our family enjoyed it and we talked about ordering some for family members since they are kosher certified. 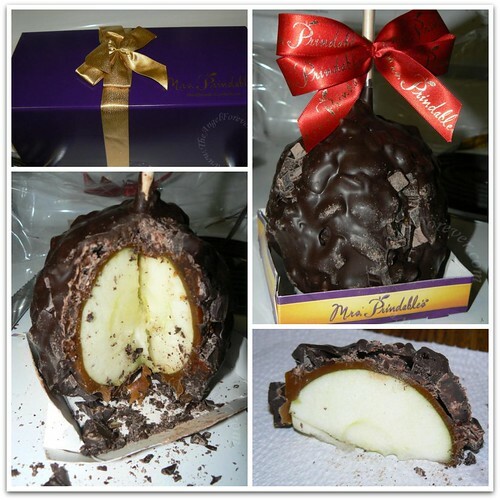 Recently, we were asked to try another one of the Mrs. Prindable’s gourmet apples. There was no way the boys would let me turn this down, so we immediately agreed. A short while ago, the jumbo Dark Chocolate Delight apple arrived at our house. Before I share what we thought, here is a bit more about Mrs. Prindable’s. In addition to the 8 traditional signature flavors, Mrs. Prindable’s is introducing 3 brand new Holiday flavors. Now available are Dark Chocolate Raspberry Swirl, Double Chocolate Mocha, and Peppermint Bark. 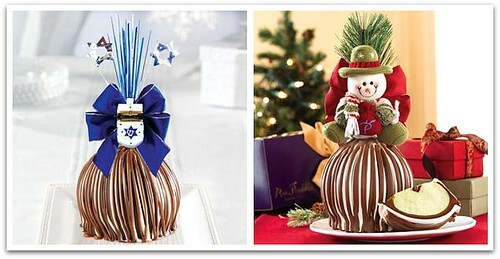 Mrs. Prindable’s also have special gift baskets and items for holiday season, including Hanukkah and Christmas. During the month of December, Mrs. Prindable’s will be giving away an apple a day on their Facebook Page. All you have to do is "like" them and comment on their daily post where a winner will be randomly selected. Our jumbo Dark Chocolate Delight apple arrived soon after Halloween. It was a nice break from the boys demanding something from their pumpkin haul. Since the boys recalled the apple from April, they were chanting for apple as TechyDad opened it up and worked on slicing it. As an observer, it appeared to be tough to cut. This is NOT a bad thing. It was thanks to it having such a large amount of dark chocolate on the outside. The good news is that TechyDad was up to the challenge and sliced up our apple. Once again, I was blown away with the perfectly crisp and juicy apple found underneath the layers. The apple hit the spot with the thick, rich, and gooey caramel that was coating it. Now I need to admit something, I am not a dark chocolate fan. Thanks to this, I found the extremely thick layer of very dark chocolate too much for my taste. Of course, on the flip side TechyDad loves dark chocolate. He thought that the dark chocolate layer was a fantastic treat and enjoyed each and every bite of the apple, caramel, and dark chocolate creation. So my advice, if you are not a dark chocolate fan, please pick one of the other apples that you will enjoy more. NHL (7) liked the apple and are all of it, while JSL (3) ate some of the chocolate off and then said he was full. The next day we still had some of the apple left. TechyDad asked if I wanted some. I told him I was interested in the apple, but not the chocolate. We struck the perfect deal. He pulled off most of the dark chocolate and had a nice plate full of that, and I ate the juicy apple slice with the caramel on top. See, we are a good team! Now to figure out which ones to order for holiday gifts for some family and friends. Hmmm……..
Disclosure: I wrote this review while participating in a campaign for MomImpact on behalf of Mrs. Prindable’s. My family received a jumbo Dark Chocolate Delight Gourmet Apple to facilitate our candid review. No other compensation was given and all opinions are from my family. My mouth is watering. Is it a problem that I want one at 8 AM? Oh my word – would I love one of those apples right now!